When all else fails, a hand operated pump may yet become necessary! 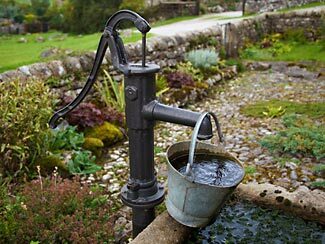 If you have a well, you need a pump to do two things for you – one obvious, the other perhaps not quite so obvious. First, you need to pump the water from whatever level the water table is underground up to the surface. Second, you need to then pressurize the water for ongoing distribution from the well-head. Considering the second point first, home water pressures are typically in the range of 30 – 80 psi, with 45 – 60 being considered optimum. Each pound per square inch (psi) of water pressure is equivalent to raising the water 2.31 ft, so a 20 psi pressure can be thought of as the same as adding another 46.2 ft, 40 psi is more like another 92.4 ft, and 60 psi is 138.6 ft. So simply add however many feet of desired ‘pressure equivalent’ to the depth the water is at to find a total water lifting height. We recommend you consider a lower pressure rather than a higher pressure – sure, your showers won’t be quite so wonderful, but your plumbing system will be less stressed and less likely to leak – probably a more than satisfactory trade-off for most of us. In a perfectly efficient pumping situation, you would be able to lift 319.5 gallons one foot by using one Watt hour of power. But pumps are rarely perfectly efficient. Typical efficiencies range from around 40% up to about 70% in the best case scenario. Smaller pumps are typically less efficient than larger pumps. If we aim for 55% as a mid point, this suggests 175 gallons can be lifted one foot with one Watt hour of power. Note – usually efficiency trade-offs are balanced in part by cost considerations (the other part being unavoidable design issues), and these considerations are based on an assumption that energy is freely available and affordable. Neither is a valid assumption in a Level 2 or 3 scenario, so we urge you to pay extra up front for the best efficiency possible. A more efficient system in any scenario might have an impractically long apparent pay-back period in today’s situation, but when your energy becomes in short supply and massively more precious than it is today, the pay-back periods will become very short indeed. If you have a 100 ft deep well, and if you want to pressurize your water to a bare minimum of 30 psi (ie another 69 ft of lifting), each gallon of water you pump will require almost exactly 1 Watt hour of power (assuming the 55% efficiency). You could pump 1000 gallons for a kWh of power. Here’s an excellent explanation of how these figures were derived. So that is the energy cost of pumping water – about one kWh for 1000 gallons lifted 169 ft (a combination of well depth and pressure height) in a realistic type of scenario. More lift means more energy, of course. In an off-grid situation, where are you going to get that 1 kWh of energy from? Let’s see what it might require in meaningful terms. A 10 sq ft solar cell array would generate about 100 – 125 Watt hours in an hour of bright sun; allow for inefficiencies in converting to battery power or whatever else, and say best case scenario is 100 Watt hours per hour of direct sun. So this one solar cell array would provide sufficient power to pump 100 gallons/hour of water in bright sun. In not quite so bright sun, of course, you’ll get less energy and it will take more hours of ordinary obscured sun and cloudy days to generate the same amount of accumulated Watt hours of power. You’d need to work out how many gallons a day of water you need to be able to pump, and match that to a suitably sized solar cell array; and probably you’d add some storage – either battery or water to balance out between bright sunny days and dark cloudy days. On bright sunny days you’d either divert the extra energy into a bank of batteries or simply pump more water than you consume, storing the surplus in tanks, and on dark cloudy days you’ll either run the pump from batteries or take your water from the tank storage. Our personal preference is to store the surplus energy in the form of water in tanks. It is the simplest and lowest-tech solution, and there is much less to go wrong and fewer inefficiencies in having water sitting in a tank than in having electricity being converted into and out of a bank of storage batteries. If you were running a diesel generator, a rule of thumb is that a gallon of diesel will convert to about 10 kWh of energy. Allow for inefficiencies in storing the electricity from the generator into and out of a battery bank, and say perhaps 7 kWh net of energy from a gallon of diesel, which means a gallon of diesel will be good for about 7,000 gallons of water pumped. A gasoline powered generator would deliver appreciably fewer kWh of energy per gallon of gas, and is also less reliable, so we generally don’t recommend gasoline generators. Alternatively a diesel powered water pump could be used at the well. You’d have fewer energy conversion losses and might get better efficiency, closer to the 10 kWh of energy per gallon theoretical maximum, but this gives you another diesel motor to maintain and care for, adding to the complexity of the equipment you have at your retreat. The other consideration of course is that sooner or later, you will run out of stored diesel and may not be able to replace it, while the sun will continue shining hopefully for as long as we need it to. Well water is not ‘free’. It has a clear energy cost associated with it, depending on the depth of your well – the deeper the well, the greater the energy needed to lift the water up to the surface and to pressurize it for distribution. Fortunately, the energy required to bring water to the surface is not excessive. Depending on the amount of sun where you live, a solar cell array that probably costs $1000 or so would be enough to power a pump capable of giving you several hundred gallons of water on most average not-too-cloudy days, and some storage tanks for the pumped water would give you a store of water for cloudy days when insufficient water could be pumped by the solar powered pump. I’m surprised you haven’t mentioned “wind power” here. Not the modern “wind turbines”, but the old fashioned windmills that are common throughout many farming areas, to power livestock watering troughs and such. I think I read somewhere that (at least in my state) they are only “legal” for use with livestock; I’m not sure why that is, unless it is because the wind (being irregular by nature) cannot guarantee a steady rate of flow, which might be required by building codes for household use. But hey, what the heck, if TSHTF and all the electric well pumps are out of commission, that “irregular” wind supply pumping water out of the ground is going to start looking pretty good, I would think. Old fashioned windmills are an interesting topic to consider, but we felt it to be a bit removed from the main consideration of this particular article, and better suited for consideration elsewhere. We’re a bit unsure about the real world value of windmills – either the new high tech power generating turbines, or the older traditional farm windmills. In the case of the the old style windmills – which these days it seems are only made by one or two remaining companies in the US – most notably Aermotor but also Iron Man Windmill – although they are not nearly as common as they used to be (in their heyday, there were 600,000+ windmills around 1930, today, no more than 60,000) they remain a viable and effective way to pump water, even in low winds (you probably need about a 5 mph breeze to start moving water). Windmills come in different sizes (ie diameters) and heights, and the largest windmills can lift water almost 1,000 ft vertically, and/or can move up to 1,000 gallons of water an hour in a strong wind. Smaller windmills and weaker winds can still see 100 ft lifts and 100 gph. Our sense is that the availability of reliable cheap electricity, even in remote farm locations, replaced old fashioned windmills, but in a future TSHTF scenario, you can say goodbye to electricity as being cheap or reliably available and so windmills can be expected to see a revival as a means of lifting water, although perhaps not quite so much as a means of generating electricity. We’ve not done an evaluation and review of handpumps, but will put it on our list. Clearly, a hand pump as a backup or as a primary method of getting moderate quantities of water is an essential item. Thanks for the suggestion. grufus & other companies make & sell 12-24 volt DC pumps capable of 100 ft lift. I bought (1) mine sitting at 75 ft puts out 100 psi if you want . Have it @ 40 psi. found (1) on ebay orange in color 1.3 gpm does work (cheap) does what it says I have for emergencies.